I must confess to having not done very well with my stretch-mark-oil testing duties, this pregnancy. I’ve been on the body balms instead (a round-up of those is imminent) even though oils are, I would suspect, slightly more effective when it comes to keeping the skin on my body nice and supple. 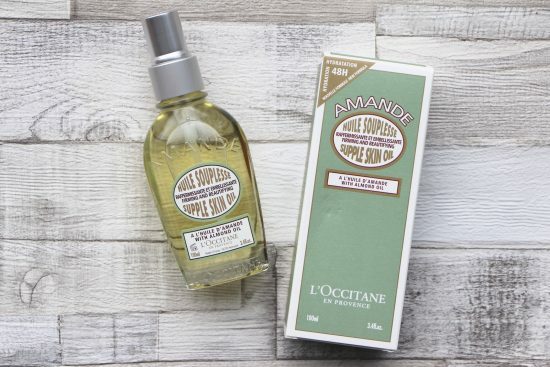 But I make a regular exception for l’Occitane’s Almond Oil which makes me smell as though I’ve had a two hour pamper session and not a ten minute bath with a toddler who did a mini-wee in the water and then joyfully splashed it over my face. I first used this properly when Angelica was just a newborn – I went to live at my parents’ for a month or so because we’d run out of alternative accommodation when our house was being renovated, and my Mum had l’Occitane’s Almond Supple Skin Oil in her bathroom. I’m not sure she was best pleased about the fact I’d ploughed through a whole bottle by the time we all left, but it was just so moreish! I’ve mentioned the fact that it smells amazing, but the skin benefits are great too. Having a pregnant stomach that’s as large and tight as a drum is actually rather useful for testing out skin things – you really notice if something properly works. And this properly works – it’s not just softening, it really reduces that sense of uncomfortable tightness and this, surely, must be a good thing in the long run when it comes to the condition of pregnancy skin. I like the fact that it manages to work its magic whilst being very lightweight – no greasiness at all, no need for prolonged massage, if you’re short on time. Budget Pregnancy Stretch-Mark Oils Reviewed…. One thing I’d change – and this goes for loads of oils – the spray. Sprays on oils just do my head in – it takes an age to get the product onto your body and if your fingers get oily then it’s almost impossible to press the spritzer down! I like the simplicity of the pourer on the Burt’s Bees Mama Bee Oil – just push it open, pour some into your hand, apply… Small niggle, but worth noting. 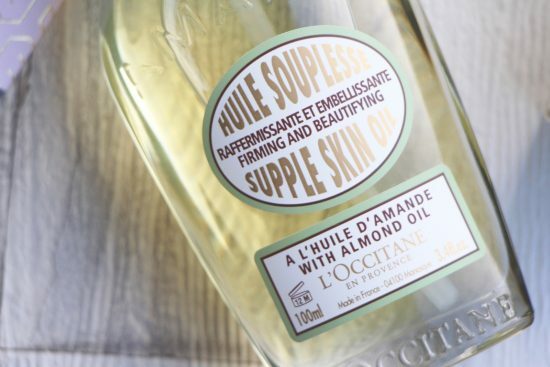 l’Occitane’s Almond Supple Body Oil is £34 online – though good old Escentual.com sell it for £30.60 here – and if you fancy something more zingy and citrussy and slightly more robust in feel then I can highly recommend the Burts Bees one. That’s currently reduced from £9 to £6.49 at Amazon here.